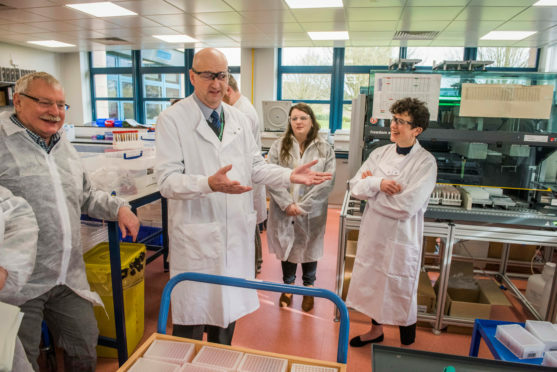 Rural Affairs Minister Mairi Gougeon, right, opened the new SRUC animal disease surveillance lab on the outskirts of Edinburgh. Scotland’s animal disease surveillance capacity has taken a leap forward with the opening of a £1.6 million centre on the outskirts of Edinburgh. It promises faster, more reliable diagnoses for all of Scotland through the use of new technology, robotics and human expertise. The lab was opened by Rural Affairs Minister Mairi Gougeon. Based at the Moredun Research Institute campus in Pentlands Science Park, Scotland’s Rural College (SRUC) lab creates a closer working relationship between two of the Scottish agricultural research giants which aim to advance livestock health, welfare, production, disease surveillance, and resilience through joint research. It brings together SRUC’s diagnostic and analytical teams from around the Midlothian area, as well as Perthshire and the Borders, into a single centre. It is expected that the lab will analyse more than a million samples a year, and scientists say faster disease diagnosis has the potential to improve response times to potential outbreaks, which will safeguard both animal and human health and protect the food chain.